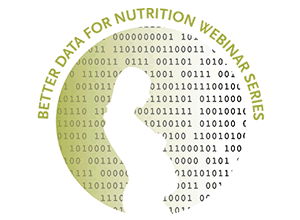 The Better Data for Nutrition webinar series draws on SPRING's team of nutrition, agriculture, and behavior change experts to share and discuss tools and solutions to address data gaps and make better use of data for improved nutrition outcomes. On March 9th, SPRING launched a series of webinars on Better Data for Nutrition, which provide an opportunity for practitioners to explore how data can be used to support and improve global nutrition programming. A presentation by Monica Kothari (PATH), providing a brief history of nutrition in DHS surveys and summarizing key findings of the Nutritional Status of Women and Children report published in 2014. The key topics include nutritional status of children and women, breastfeeding, complementary feeding, anemia, dietary diversity, micronutrient supplementation, and diarrhea prevalence in 37 countries between 2005 and 2013. This report summarizes the patterns seen in these indicators by background characteristics and water, sanitation, and hygiene (WASH) indicators. A presentation by Celeste Sununtnasuk (IFPRI) on SPRING’s Iron Folic Acid (IFA) Technical Briefs, which uses DHS data to make a rapid assessment of the strengths and weaknesses of the distribution and consumption of IFA supplements in antenatal care system in 21 countries. Using this method, countries can assess the relative significance of four sequential points at which IFA supplementation programs for pregnant women commonly falter. The analysis demonstrates how using DHS data can help prioritize actions to improve the performance of IFA programs. An engaged panel discussion and Q&A with Ms. Kothari, Ms. Sununtnasuk, Mr. Raphael Makkonen (Nutrition Advisor, USAID), and Ms. Alexis D’Agostino (M&E Specialist, SPRING). Monica Kothari is a Senior Program Officer at PATH, providing consulting services to the USAID Demographic and Health Survey (DHS) Program since 2004 and the DFID Monitoring Quality of Scaling Up Nutrition Project since 2012. She has over 15 years of experience in planning, implementation, and evaluation of operation and evaluation research in maternal and child health and nutrition. For The DHS Program, she is responsible for maternal and child health/nutrition data analysis, supporting data collection, reporting, monitoring and evaluation activities; management of DHS’s youth/adolescent webpage; and conducting training and supervision of the measurement of nutritional biomarkers in household surveys. Ms. Kothari holds an MPH from Johns Hopkins University and an MS in Foods and Nutrition from GB Pant University of Agriculture and Technology, Pantnagar, India. Celeste Sununtnasuk joined SPRING in 2013 and is currently a Senior Research Assistant at the International Food Policy Research Institute. While at SPRING, Celeste’s work focused on using Household Consumption and Expenditure Surveys as diagnostic tools to identify micronutrient intake levels and the prevalence of inadequacies at national and sub-national levels, and providing support to SPRING’s anemia technical area. Her current research examines the relationship between serum aflatoxin levels and socioeconomic factors, and serum aflatoxin levels in children and subsequent growth. Ms. Sununtnasuk graduated with an M.S. in Agricultural Economics from Purdue University. Mr. Makonnen is a Nutrition Advisor in the Nutrition Division of the Office of Health, Infectious Diseases, and Nutrition at USAID. He provides broad expertise in public health nutrition toward achieving the overall operational objectives of USAID, specifically in (a) nutrition assessment, designing, programming, monitoring and evaluation, focusing on nutrition-specific interventions, mainly maternal nutrition and care, breastfeeding, infant and young child feeding, and analysis and interpretation of nutritional indicators; and (b) food security, food and nutrient intake assessment, cross-support with agriculture and livelihoods, food safety, WASH, and private sector roles in support of nutrition programs. Mr. Makonnen has a B.Sc. from Georgetown University School of Foreign Service and a MPH from Columbia University Mailman School of Public Health. Alexis D'Agostino is an M&E Specialist for SPRING with a background in quantitative program analysis, research and data collection, and project management. Her primary areas of expertise include primary and secondary data analysis, survey design and implementation, and qualitative research methods. She has a Masters of Public Policy with a concentration in Global Policy from Duke University's Sanford School of Public Policy and received her BA in International Relations and Foreign Languages from Claremont McKenna College.